HDD 250GB sata 2 chạy nhanh, mát. 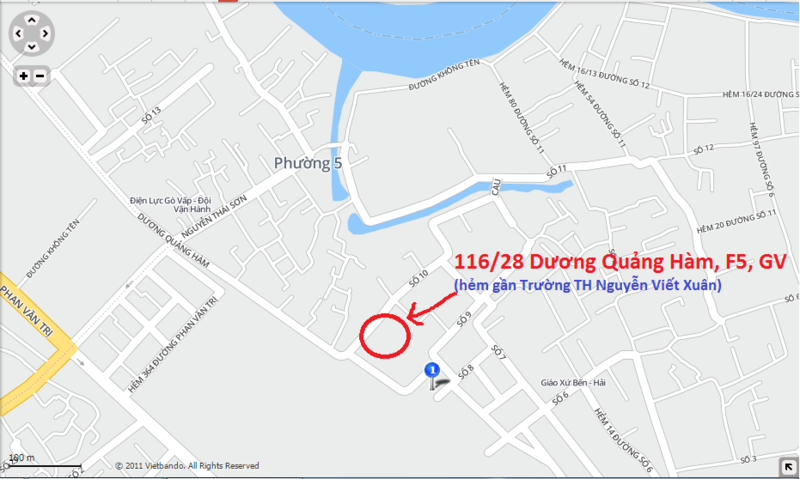 VGA: Intel HD Graphics - chơi được game LOL, Liên Minh, Đột Kích, game Truy Kích. Màn hình: 14 inch, phân giải HD 1440x900, sáng, đẹp long lanh. Who buys EliteBooks? Meanwhile, we”ve got a pretty good idea about that. 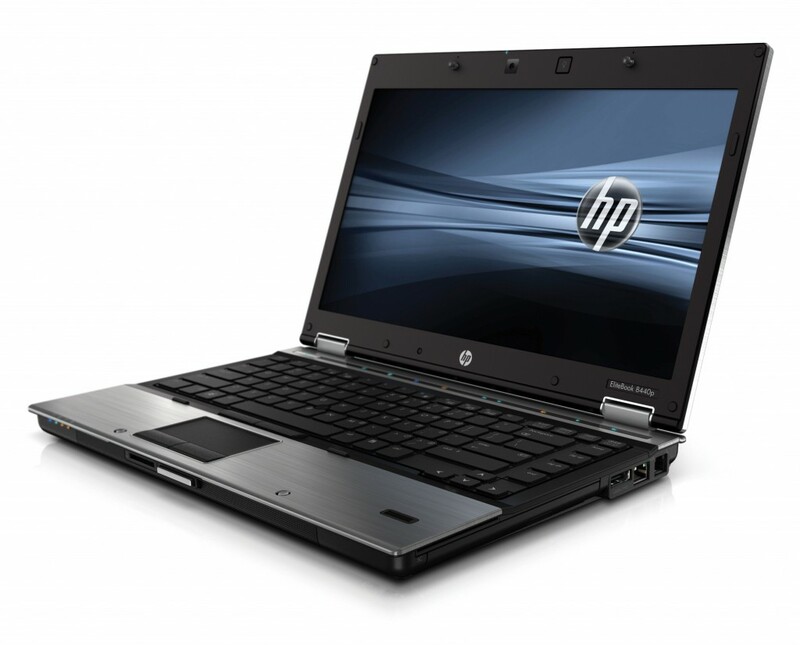 We”ve recently had the HP ProBook 6540b WD690EA in review, which delimits the EliteBook series downwards. You might also say: If a ProBook doesn”t suffice, you”ll buy an EliteBook. The premium business models” price starts at about 1150 euro. 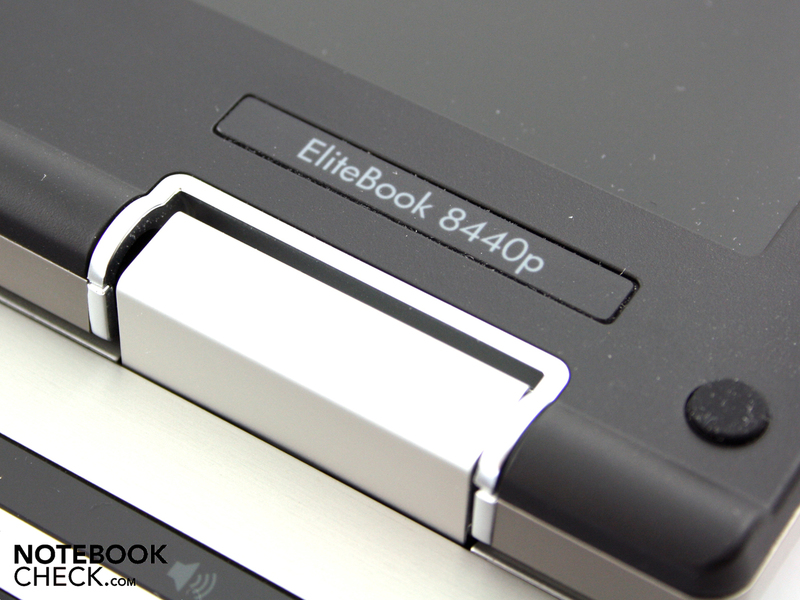 We”ve chosen one of the lowest priced EliteBooks. 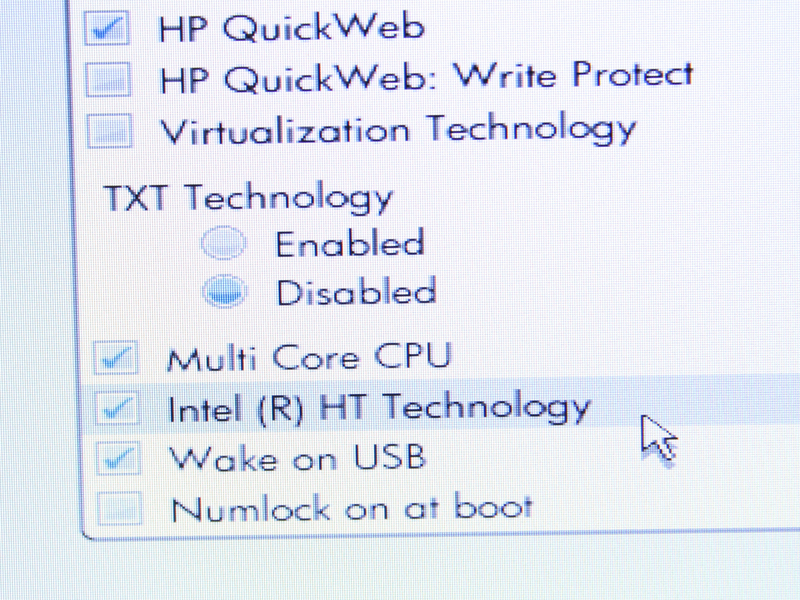 There are almost no limits towards the top because HP also places its workstations under the name "EliteBook" by adding "w". Our 14 inch 8440p is technically limited to the basics with a Core i5-520M and without a dedicated graphic card. A high-resolution display is just as absent as a UMTS module. Whilst notebook series aligned for consumers are always getting thinner, flatter and lighter, HP apparently adds a bit to guarantee higher stability. The 14 incher is indeed a massive piece. Its highest part measures 3.1 centimeters. We”ll also notice what we are carrying around due to the weight of 2363 grams. It would be wrong to assume that business users aren”t looking for the perfect weight. However, the manufacturer has uncompromisingly decided in favor of high-quality and stability. And it”s made a home run with it. The base unit is as solid as a rock and can”t be twisted at all, even with force. We can”t dent the wrist-rest or base plate anywhere. The lids stiffness is almost sensational. We can only twist it just slightly at the corners. The silver area stays firm up to the end. Of course, we can dent it slightly with a lot of selective pressure. But it”s not possible over an area. The reason for this quality is the selected materials beside the stability. Lid, wrist-rest and the strip above the keys are made of brushed aluminum. Thus, the surfaces feel cool and are very scratch resistant. 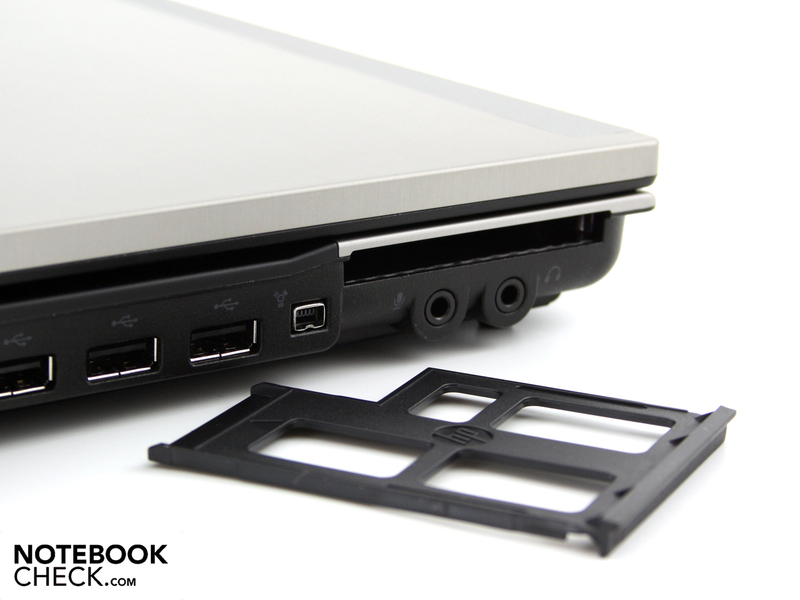 The manufacturer uses real metal for the hinges, just like in the ProBook. The hinges are fixed tight to the base unit. No tearing or pressing can move them. They keep the lid tight in position (no teetering). We can open the lid single-handedly despite the base unit”s heavy weight. Appreciated by pros and popular amongst demanding customers: Docking stations and numerous connections for all needs. The 14 incher has everything that is expected in a modern work notebook. 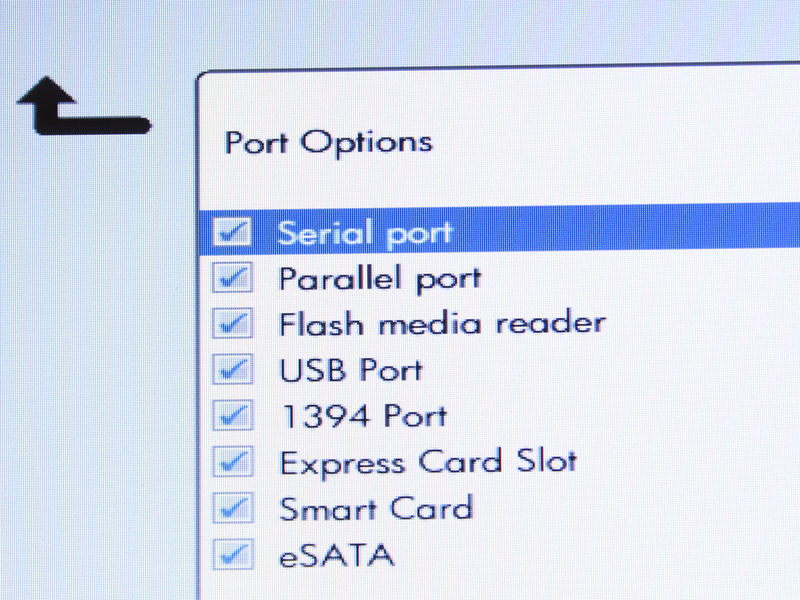 The almost extinct modemport (RJ-11), display port, FireWire (i-Link) and eSATAbelongs to this. 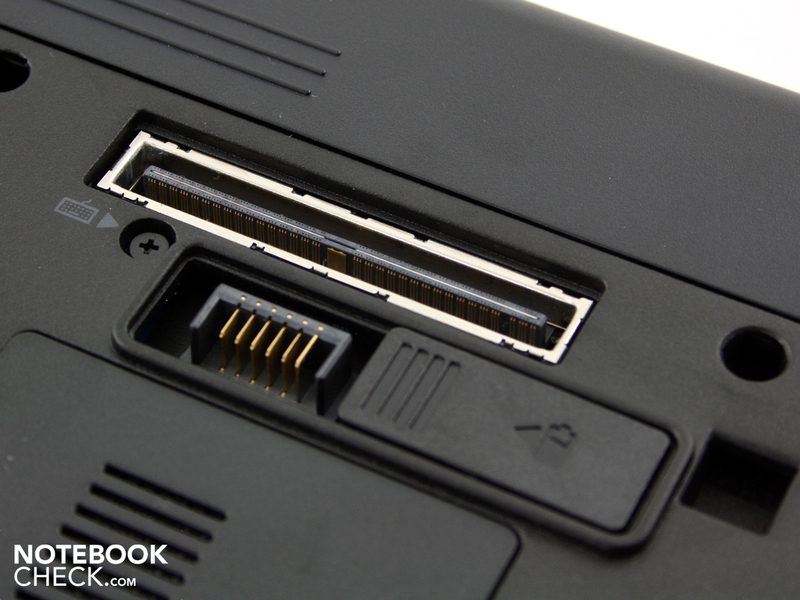 If specific interfaces are missing, users have the possibility to retrofit via the ExpressCard54 slot. HP uses a display port instead of HDMI. This port allows 2560x1600 pixels on an external display. The front isn”t occupied with any connections. The right side provides for a small highlight, though. The eSATA port has been rather unusual in business notebooks until now. Even a FireWire is onboard beside it. The eSATA supplies a fast data transfer to external eSATA hard disks. They work almost as fast as if they were internally tethered. There are two cardreaders. One for memory cards (SD, MMC) on the case”s front and one for SmartCards on the right. SmartCards are login cards for person-related computer utilization. Particularly, large IT infrastructures use this security system. If you are annoyed about connecting and disconnecting cables after business trips, you can buy the matching HP NZ223AA Advanced Docking Station (street price 240 euro). 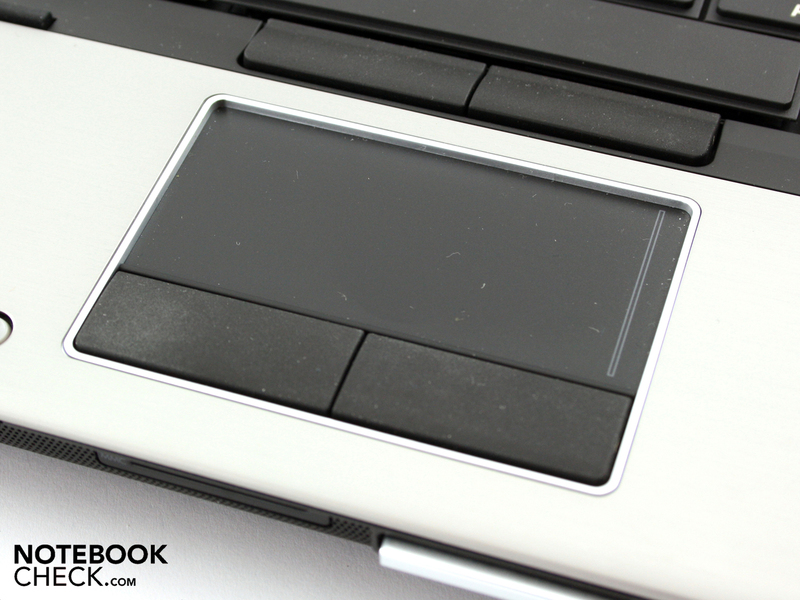 It”s the same docking solution as used for the ProBook-series. The 14 incher is attached to the docking port with its base plate. The station has almost all connections that the notebook has. Additionally, there is a parallel port (printer port, LPT, 25-pin). Naturally, the laptop is also recharged over the station. 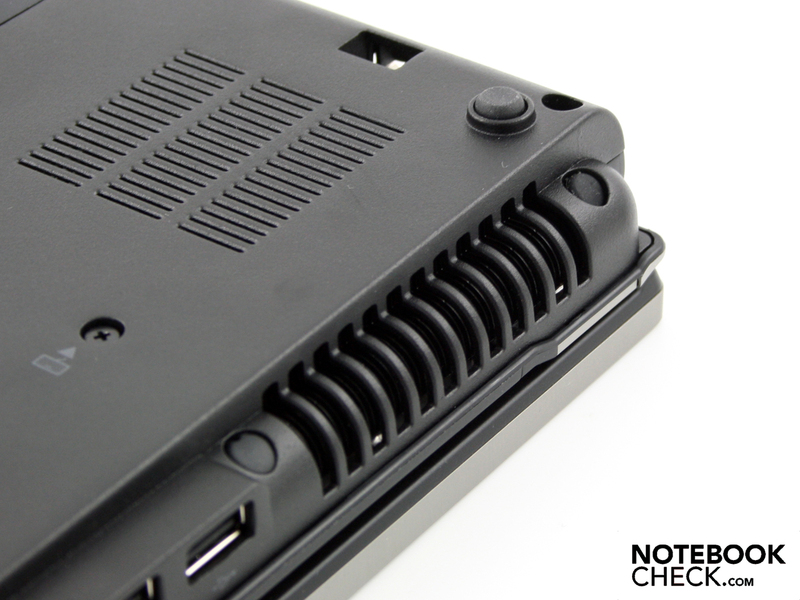 Upgrade fans will find an integrated SATA extension slot, e.g. for a hard disk, on the station. But that”s not all yet. The so-called 12 cell battery with an extremely high capacity (AT486AA, 180 euro) can be attached to the device”s bottom (battery dock). The standard battery remains inserted during that. HP states an additional 10 hour operating time. 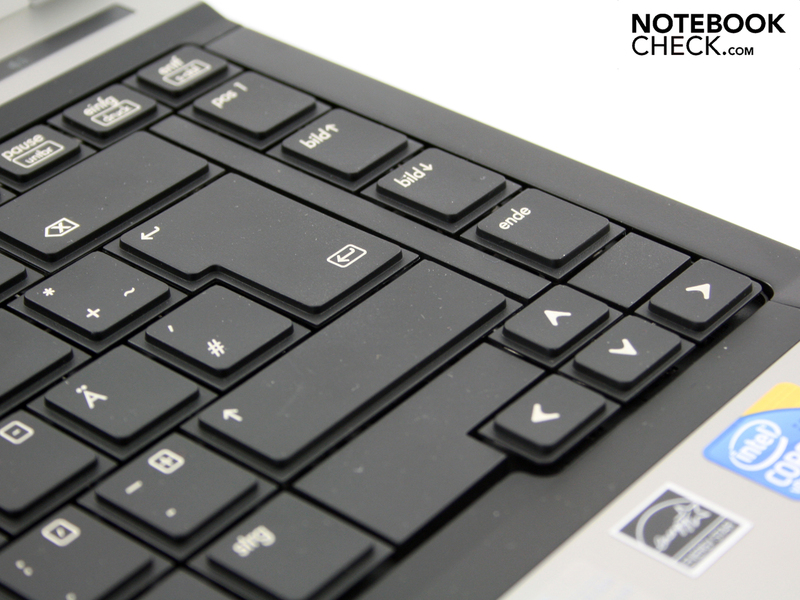 The EliteBook”s keys sit tight and thus give the typist a very solid stroke. It will already be too solid for some typists, others will love it. That what is valid for the workmanship applies even more for the keyboard: The quality is very high and the feedback without blame. The key distance isn”t as big as in desktop keyboards, but the single key surface is almost as big (width: 15mm; 18mm with base). The keys have a distinct pressure point and a very large stroke length. The clearly separated arrow keys make a good impression. Fingers can find them without having to look and there are hardly any typos. 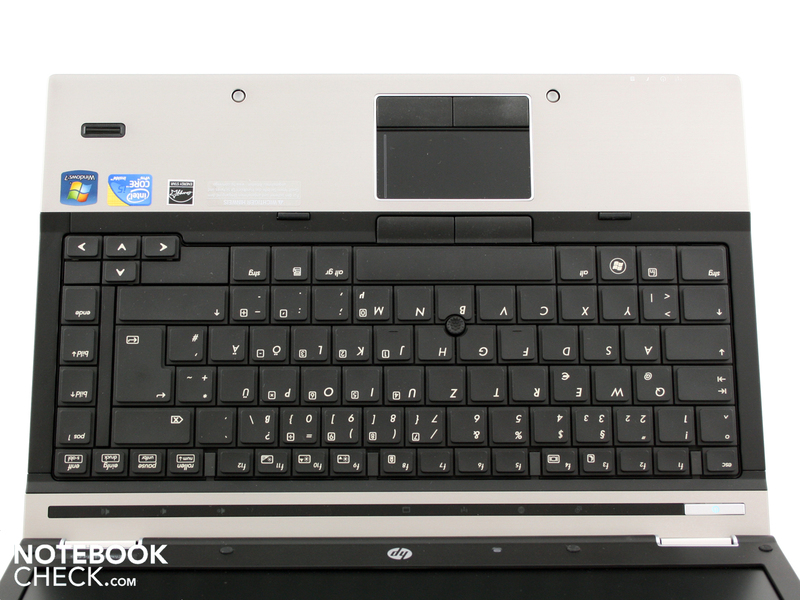 HP has omitted a number pad in favor of key size. But not page and position keys, which are found on the keyboard”s right edge. Number pad users can enable the number pad marked on the letter keys via FN+Num. The touchpad isn”t particularly large (80mm diagonal), but it”s sensitive to the edges. The field has a vertical and horizontal scroll area. Merely the vertical one is visibly marked. The horizontal scroll is disabled in state of delivery. The Synaptics V7.2 is actually a multi-touch pad. Practically, these functions are completely disabled(pinch zoom, multi-finger gestures). 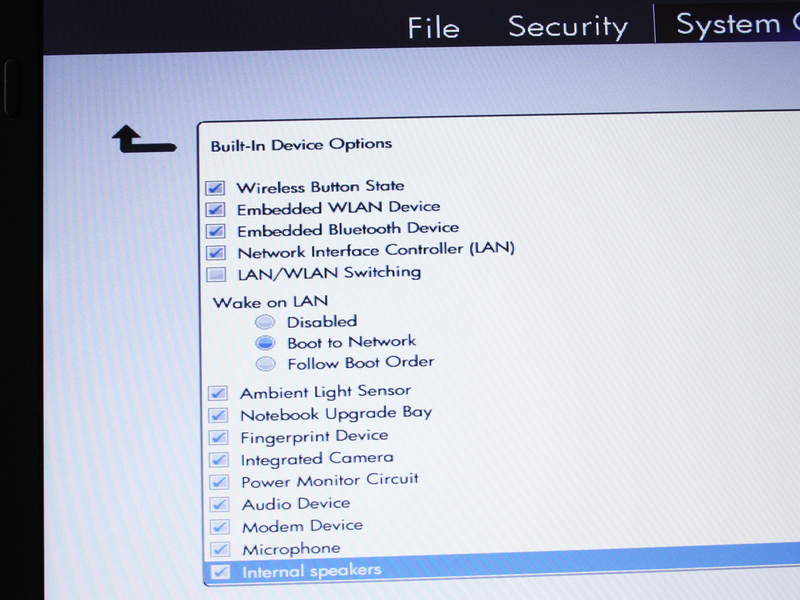 These options are visible in mouse control, but can”t be enabled. We also had this problem in the ProBook 6540b. 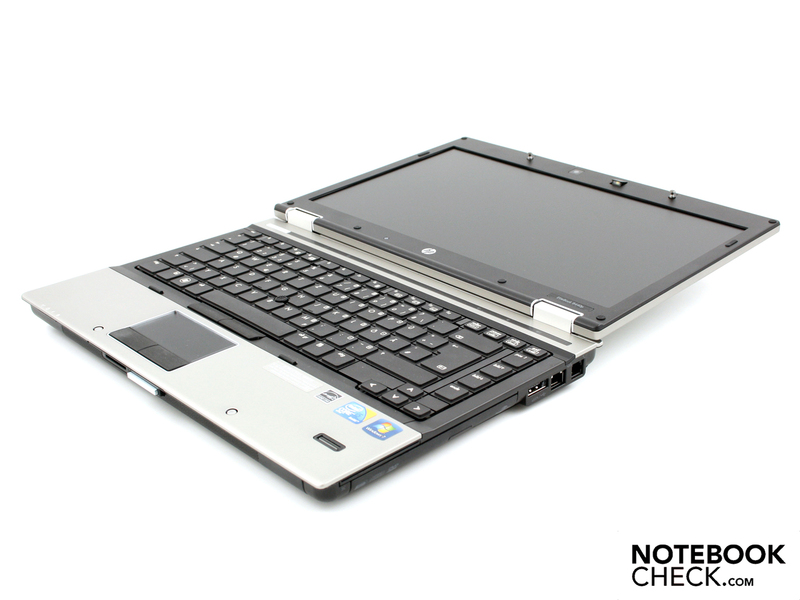 The Elitebook 8440p”s 14 inch (35.6 cm) HD Ready display has a resolution of 1366x768 pixels. The screen (type not identified) has been AR-coated, and is called glare-free by the manufacturer. A comfortable and clearly arranged working with the HD Ready resolution is only possible with massive scaling. Large Excel documents, website backends or company software with fixed dimensions quickly find their limit of clarity at a height of only 768 pixels. The low resolutionwon”t suffice many potential buyers, which is why the manufacturer has a more expensive ProBook alternative (VQ664EA) with HD+/WXGA++ screen (1600 x 900) in its range. A particularity is the omission of HDMI. There is a display port instead. Users can use external TFTs with up to 2500x1600 pixels with it. Intel”s HD graphics integrated into the processor would also allow HDMI, but the manufacturer would have to pay an additional license fee for using HDMI. The brightness of the display, illuminated with LEDs, can be automatically set. The ambient light sensor in the lower TFT”s bezel is there for that. The sensor determines how bright the screen has to be lit up depending on the room”s brightness. This works quite well practically. The luminosity also goes up to maximum in sunlight via sensor. We disabled the ambient light sensor via FN+F11 for the measurements. We measured an average rate of 212 cd/m2. The illumination is very even with 90 percent; the brightest spot is 225 cd/m2. 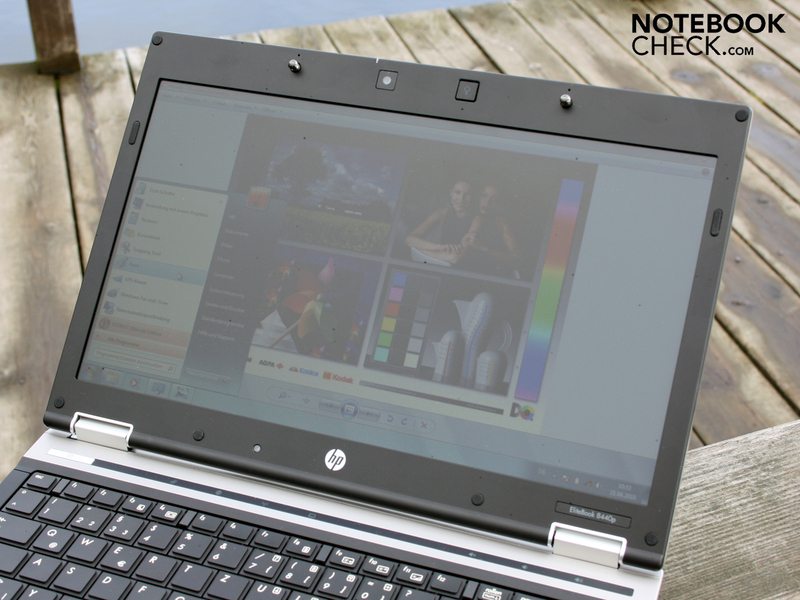 A notebook needs good viewing angles for the user to be able to look at the display from the sides or above, without seeing extremely inverted colors or a dim image right away. As a rule, office notebooks have very poor viewing angles. We expect more from the Elite class of business notebooks. The HD screen does well, but isn”tby far perfect. The horizontal viewing angles are most successful. There are almost no color falsifications up to 60 degrees. However, the display dims visibly starting at 40 degrees so that writing isn”t readable at the aforementioned 60 degrees, unless it has a font size of 20. Our eyes can deviate up to 20 degrees up and down (vertically). The colors invert evidently then. Perfectionists will be annoyed by the low vertical stability. 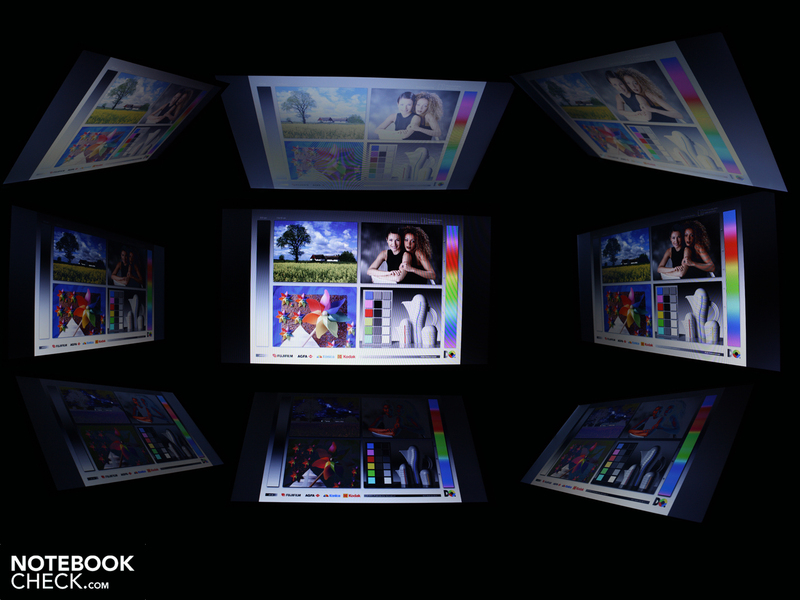 The EliteBook can”t supply the color stability of a desktop TFT. 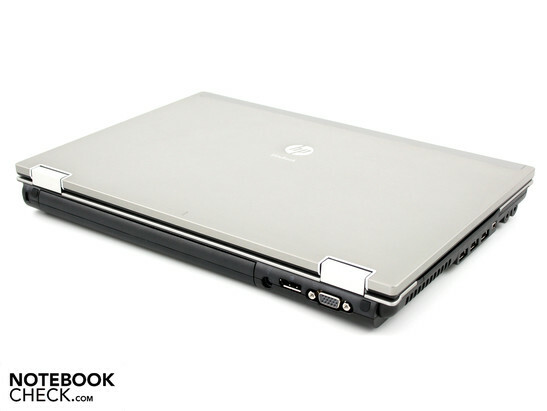 HP equips the EliteBook 8440p with a Core i5-520M (2.4 GHz). That”s the lowest configuration available. 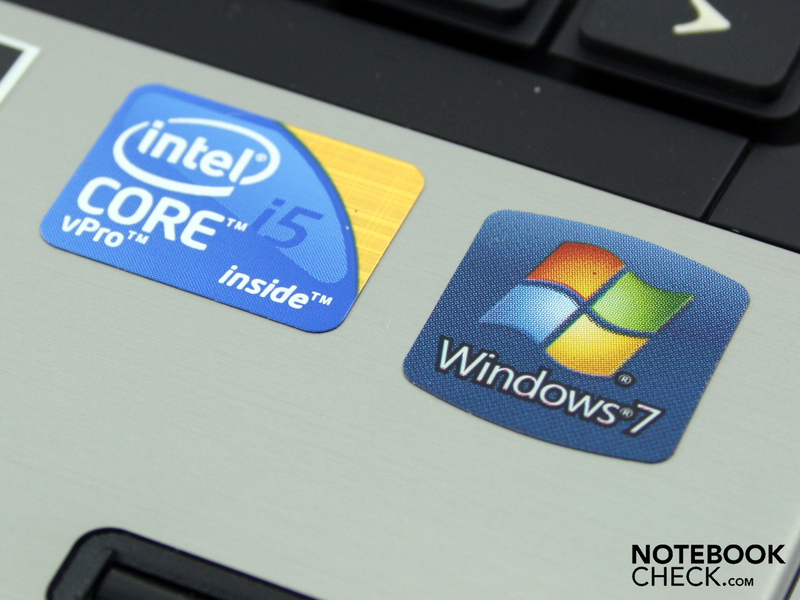 The next steps in performance line are Core i5-540M (2.53 GHz) and Core i7-620M (2.66 GHz). The manufacturer is unnecessarily stingy with the RAM. There is only a 2048 MB DDR3 (PC3-10600) inserted to the mainboard. The memory configuration should first start at four gigabytes and not already at two in this upper price category. The two GBs are on one DDR3 bar under the base plate. It”s not accessible for the user, unless the entire cover is removed. Nevertheless, there is a RAM upgrade possibility. We found a single RAM slot underneath a small cover on the bottom. The 520M Arrandale has two cores with 2.40 GHz native (standard clock rate). The real clock rate is between 2.40 and 2.93 GHz with assistance from Intel”s Turbo Boost. Single cores of the four (native + hyperthreading) are overclocked during processor-controlled overclocking. The feature hyperthreading complements both physical cores with two virtual ones. Thus, applications can access up to four threads. Naturally, turbo boost also affects the virtual cores. It should be mentioned that the initially stated maximum clock rate never is reached by all cores at the same time, but only is reached when the entire computing effort is executed by a single core. The experienced computer performance isn”t only dependent on the processor. It”s an interaction of CPU, graphics (IGP in this case), RAM and hard disk, which makes the 8440p to a strong office notebook. We”ve checked the application performance with PCMark Vantage. Its total result of 5770 points indicates a strong system in comparison. 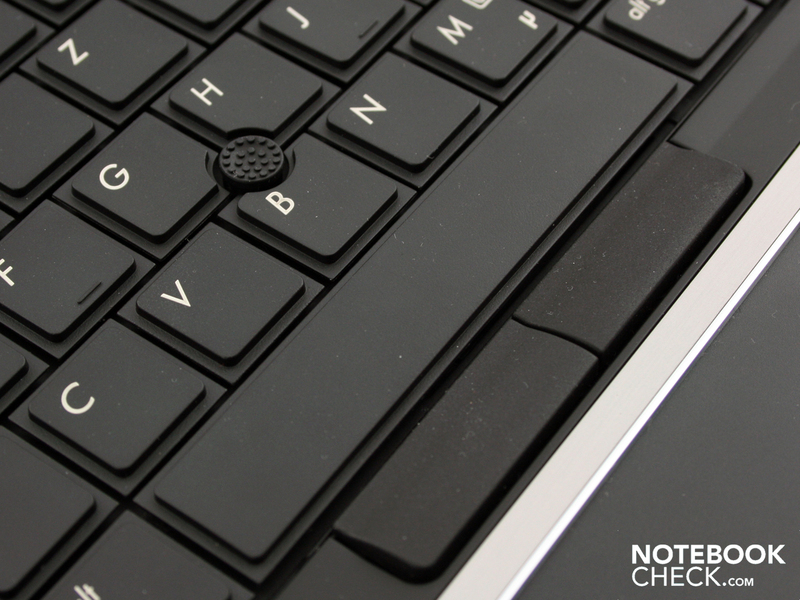 Laptops with a Core i7 720QM or 820QM have more performance. Dedicated graphics wouldn”t increase the Vantage rate dramatically. Thus, Samsung”s R780-Hero achieves 6026 points with the same 520M processor and Nvidia GT 330M. Recently reviewed business laptops don”t score much better in comparison: Fujitsu”s Lifebook S760 (620M, Intel HD: 6.178); Lenovo”s ThinkPad W510 (820QM, FX880M: 5.857); Sony”s Vaio VPC-F11Z1/E (720QM, GT330M: 5.844); Fujitsu”s Lifebook T900 (520M, Intel HD: 5.591). The recently tested HP ProBook 6540bWD690EA (430M), with a similarly fast hard disk and dedicated ATI HD4550 also only achieved 5158 Vantage points. The fast 7200 rpm hard disk from Seagate (ST9250410AS) is noticeable with its 250 GB. The HDD reads faster than average with 78.3 MB/s in sequential read. The hard disk is only audible with a consistent basic noise during use. However, the desktop also unfortunately hums because of the 2.5 inch HDD”s rotation speed. This isn”t necessarily disturbing. The noise can be eliminated by placing the base feet on a soft surface. Readers might know this phenomenon from fast rotating, external hard disks. Apart from the slight hum effect of the 7200 rpm hard disk, all noises emitted from the EliteBook 8440p are within a green field. Anything else would have annoyed us because the massive case has enough elbowroom to cool the "devoid of a graphic card" system. Surfing, writing emails or taking care of Excel lists - all of that takes place in the lowest fan rotation level (31.1 dB(A)). If the active cooling does get louder under low or short load, it turns itself off again almost immediately. The slight hard disk clicking during write and read activity stays within a limit with a barely audible 33 dB(A) and doesn”t bother us. No matter what we did in the test, the surface temperatures simply didn”t increase. We didn”t even manage to increase the waste air temperature on the surface over 33 degrees Celsius selectively after a stress test of several hours. We measured this maximum temperature in the power button”s area. The case doesn”t get warmer than 32 degrees even in the vent”s vicinity. Those are remarkably low temperatures for a stress test. It can only get better when there”s nothing to do. And in fact: After two hours in standstill idle, the previously warmest spot near the power button is only 24 degrees warm. The base plate no longer exceeds 27 degrees. Let”s look at the temperature sensors on the processor: It shows 40 degrees on the CPU in idle. It doesn”t get more than 69 degrees under 100 percent stress (35 watt TDP). The cooling system works exemplary. The manufacturer cites "integrated stereo loudspeakers". We couldn”t find one of the two loudspeakers at first because the sound escaped from the case”s bottom. The assumption of a mono loudspeaker proved to be wrong. The stereo loudspeakers are placed on the front in the area of the release button. The loudspeaker”s sound emphasizes the midranges and lacks all bass. The sound picture is a bit dull but is at least very loud and clear enough to fill a presentation with sound. We notice a exceptionally strong output level when external speakers are connected to the 3.5 mm audio-out. Thus, external loudspeaker can be used without noise. The 14 incher is equipped with a 55 watt hour battery(4910 mAh). It keeps the EliteBook upright for almost five hours (287 minutes) during WLAN use (web surfing). Up till now you”ve needed an energy saving ULV processor, like Intel”s Core 2 Duo SP9400, for such long runtimes. The Dell Latitude E4300 could only achieve a few minutes more of runtime with it (290 minutes). A DVD movie runs almost three hours (166 minutes). The brightness was set to medium and wireless modules were disabled. The maximum runtime that we established with BatteryEater Reader”s test was 477 minutes. That is almost eight hours. The display”s brightness was set to the lowest level, the wireless modules disabled and the processor stayed in idle for this test. Eight hours are completely unrealistic as a purchase argument. There isn”t a situation in which a user will stare at a dark display and not even be on the internet once. The EliteBook 8440p, in our configuration variant, passed the EnergyStarclassification. No wonder, because the (lowest) idle power consumption is less than 10 watts, despite the high CPU performance. This applies when all energy savings options are exhausted and the luminosity gleams at its lowest level. Seen realistically, the energy requirement without battery charging in an undemanding use (WLAN, surfing, office, emails) will be just about 20 watts. 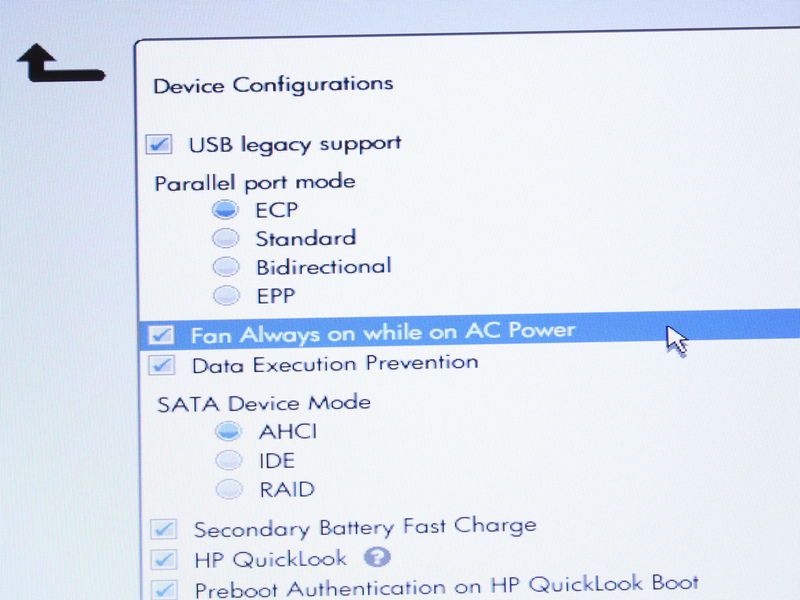 Merely CULV or a few Core 2 Duo notebooks could proclaim such a low idle power consumption until now. One exception is the highly optimized for energy Sony Vaio VPC-Z11X9E/B(520M, GT330M) with 6.2 watts in idle (minimum). 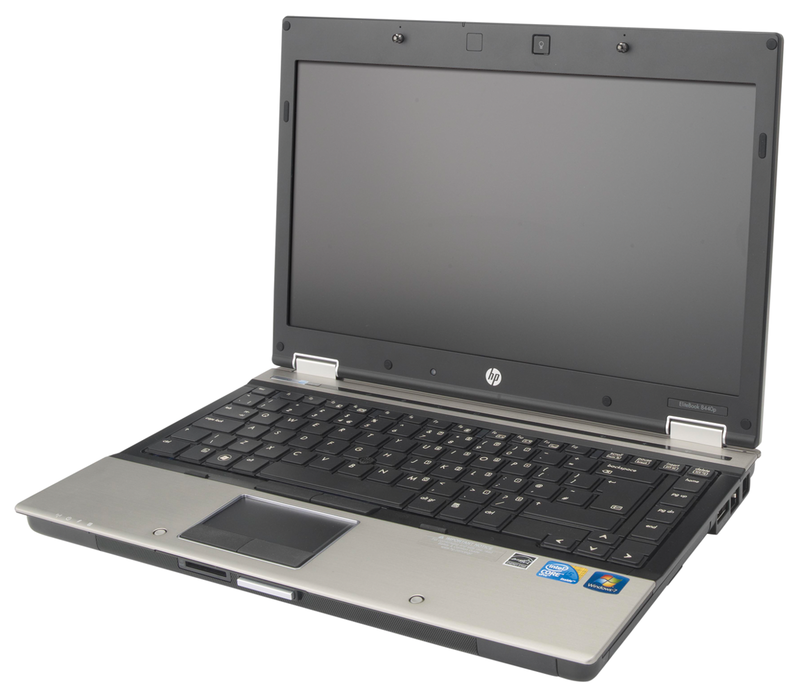 The HP EliteBook 8440p-WJ681AW is an office notebook for not quite 1200 euro. That”s a lot of money for the office class, but the EliteBook provides first-class business qualities. If you deliberately waive on a graphic card with the 14 incher, you”ll get pure computing power with the Core i5-520M processor. All kinds of applications, no matter if optimized for multi or single-core, are managed fast with Intel”s CPU. Additionally, there is a fast 7200 rpm hard diskwith a high data throughput. 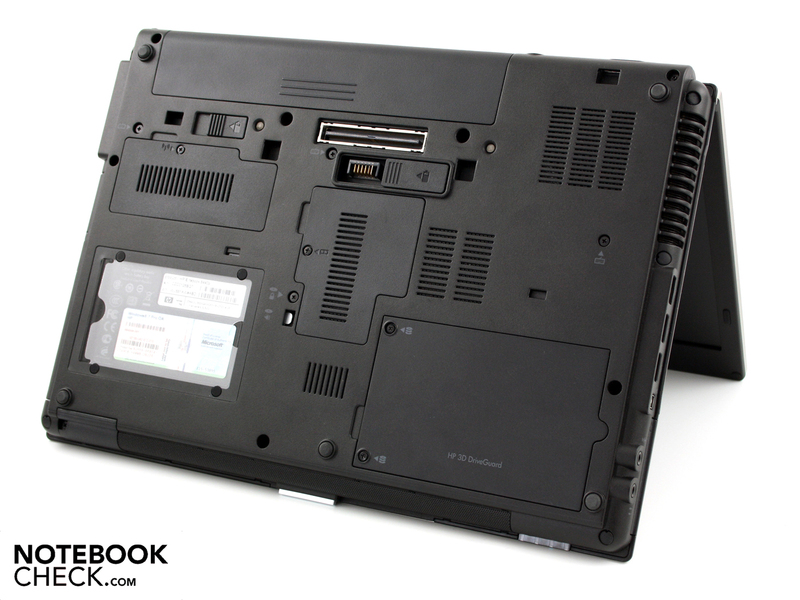 The business notebook is distinguished by a vast configuration of connections(incl. docking options), the high-end input devices and the excellent workmanship. The case is heavy, but it conveys the impression of wanting to last for an eternity with its aluminum and metal details. The only weak point is the low HD Ready resolution and the prototypes low contrast. 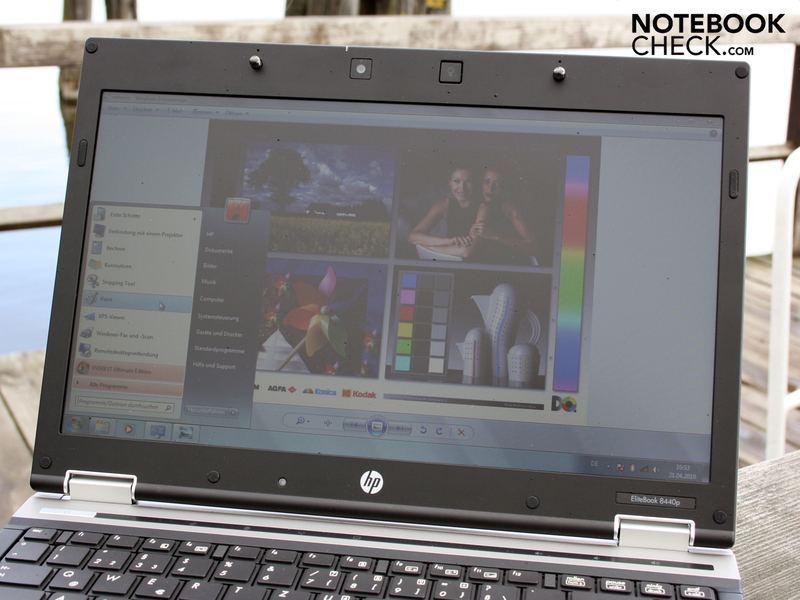 But HP also has notebook alternatives with an HD+ screen (1600x900) available. If you don”t want to waive on a dedicated GPU, you”ll find a NVIDIA Quadro NVS 3100M in the 8440p-VQ667EA model. It only has the starter performance on the level of a GeForce 210M or 310M, though.